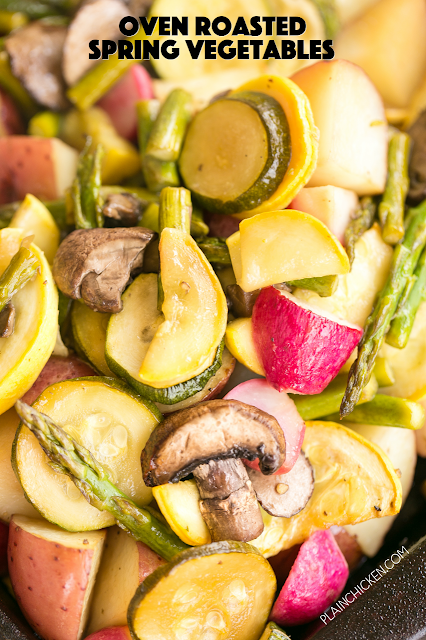 Oven Roasted Spring Vegetables - potatoes, asparagus, squash, zucchini, radishes and mushrooms tossed in balsamic vinegar and brown sugar. Something for everyone!! Such and EASY side dish recipe! Just chop, toss and bake. Ready in about 35 minutes. Everyone LOVES this dish! Great with grilled chicken, pork and steak. These Oven Roasted Spring Vegetables are one of our favorite side dishes in the spring and summer. We love to serve these veggies with grilled chicken, pork and steaks. It would also be great with your Easter ham!! 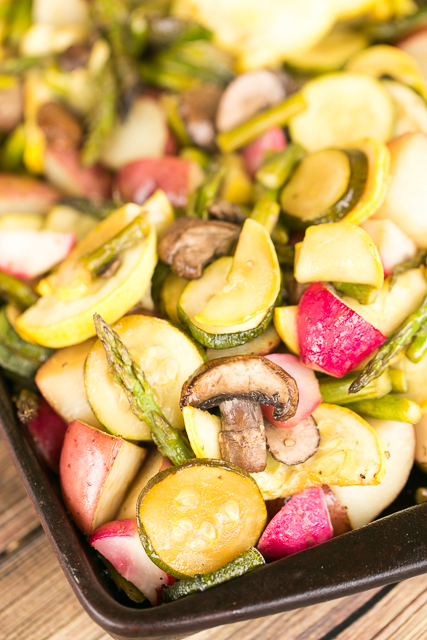 Potatoes, asparagus, squash, zucchini, radishes and mushrooms - there is definitely something for everyone! This recipe makes a TON. I usually make a batch on Sunday and we will eat these Oven Roasted Spring Vegetables with dinner the rest of the week. This side dish is so easy to make. Just chop the vegetables, toss in some balsamic and brown sugar and bake. Easy peasy! Toss potatoes with olive oil, salt and pepper. Transfer to a roasting pan. Bake for 15 minutes. Remove from oven. Combine remaining ingredients and add to roasting pan. Bake an additional 20 minutes.